FACE veterinary partner VCA California Veterinary Specialists is a 24 hour emergency and specialty care hospital with locations in San Diego County and elsewhere in Southern California. Meet one of the founding partners of CVS, Dr. Amy Carr, an emergency and critical care specialist who has dedicated her entire career to emergency veterinary medicine, and is currently celebrating the 16th anniversary of the founding of CVS! 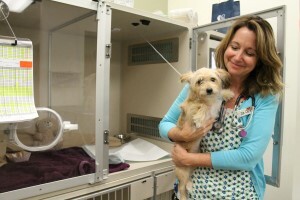 Together, FACE and California Veterinary Specialists have worked to save the lives of over 120 family pets since 2009. In her work, Dr. Carr sees multiple emergency cases each day, and appreciates the positive impact of a FACE grant for her clients. “People never expect a catastrophe to happen to their pets, and they can feel overwhelmed and alone,” she says. “Help from FACE takes the stress away, and they feel that someone is now on their side.” Dr. Carr also notes that partnering with FACE helps the emergency vets themselves avoid compassion fatigue. One of the most difficult parts of the job is euthanizing a savable pet because of lack of funds. Dr. Carr points to orthopedic cases as an example. “A young animal comes in with a fractured leg and needs expensive surgery. Without funds, the pet is facing euthanasia or amputation. With funds, the animal can have surgery to save the limb,” she explains. Dr. Carr is passionate about her job and finds tremendous satisfaction in helping clients manage crisis situations, talking them through an emotional time and aiding them in what can be a difficult decision-making process. spending time with her pets…a “goofy, joyful, and crazy Irish setter” and her “special needs kitty”—a senior cat she inherited from her mom. FACE extends our heartfelt thanks to Dr. Amy Carr and the entire team at California Veterinary Specialists for their dedication to saving the lives of animals in need of critical veterinary care!